20 Oct Knee or Hip Pain When You Run? ChiRunning to the Rescue! I ran through my injuries because I really enjoyed running and was afraid of falling too far behind my running group, but before long the pain became too much to ignore and sidelined me. I thought if I slowed down and did fewer miles the pain would resolve on its own. While it did get slightly better, it never fully subsided and became a source of dread before each run. After many different visits to physical therapists and sports medicines Dr.’s I was told that I had IT Band Syndrome and that my hips just weren’t suited for running. The PT exercises didn’t help much and at my last visit it was expressed that it would be best if I just stopped running altogether. This wasn’t an option for me. ChiRunning to the rescue! I don’t remember how I heard about ChiRunning, but feel very fortunate that it crossed my path. It transformed my pain and allowed me to run again. It taught me how to make little adjustments to my form to keep from straining my tendons and ligaments and injuring myself. I learned to lean slightly forward to use gravity to propel me ahead and to gain speed without effort. ChiRunning taught me the importance of a strong core and how to utilize it to fuel my runs instead of relying solely on the strength from my legs. I learned to strike the ground with my mid-foot instead of breaking with a heel strike and most importantly I learned how to run injury free. Ten plus years later, and I am still hitting the trails and enjoying long distance runs pain free. It turns out that all I needed was a little instruction on correct running form. What is this magical ChiRunning technique? ChiRunning is based on T’ai Chi movements, engaging your core muscles and using your whole body to run. Its main aim is to allow you to run injury free for life. Not a bad mission! ChiRunning is offered worldwide. You can visit the ChiRunning website to find an instructor or a class near you. It may really be the true key to injury prevention and recovery. If you are in the San Francisco Bay Area I highly recommend Chris Griffin. He is a master instructor and the person responsible for getting my running back on track years ago! He is fantastic. 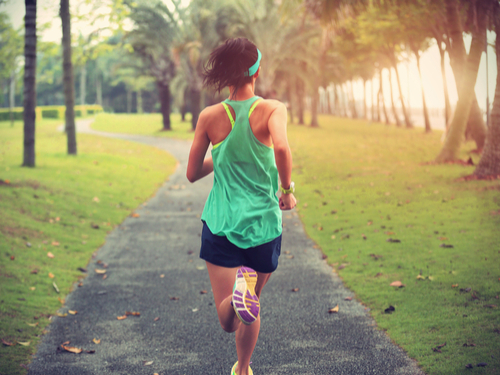 If you want to run pain free for life, ChiRunning just might be your secret weapon.